Apoptosis is a word that is used a lot in the world of cancer medicine. Apoptosis is a process that happens naturally in the body. It sounds alarming –a cell’s self-destruction—but it’s something cells need to do from time to time to make room for new, young healthy cells. This cellular suicide is actually an indication that a cellular system is functioning properly. When cells don’t self-destruct, they could be destined to become cancer cells. Cancer cells aren’t programmed to die which means they can grow disproportionately large when they combine with other cancer cells. Cancer cells need to be killed with chemo toxic agents or they have to be “manually” programmed to self-destruct. Chemo toxic agents can be either synthetic or natural. Synthetic chemo toxic drugs often come with a whole host of unpleasant side effects. Natural chemo toxic agents are generally much better tolerated by patients. Unfortunately, they are often difficult to find. Here’s one, however, that has excited scientists over the past two years: chlorella. 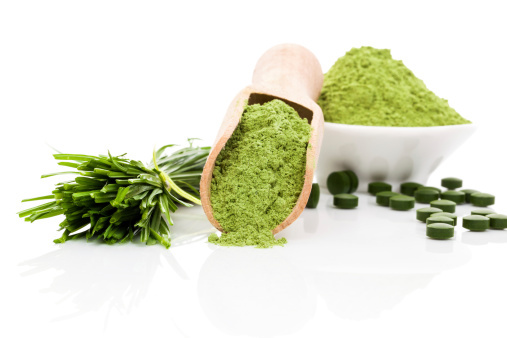 Chlorella vulgaris extract (CVE) has been examined in clinical trials to determine its ability to induce apoptosis in cancer cells. In one particular study, chlorella’s anti-cancer properties were investigated in an effort to determine just how this micro-algae stops cancer from spreading. Researchers tested the micro-algae in vitro. They treated cancerous liver cells with CVE and compared the results with normal liver cells. They were looking for the mechanisms by which CVE was able to induce apoptosis. The researchers discovered that there was a 70% increased apoptotic rate in liver cancer cells treated with CVE compared to normal cells. What’s more, CVE managed to inhibit anti-apoptotic proteins in cancer cells while leaving the normal cells’ self-destruct mechanisms in place. In another recent study performed at the Chemical Injuries Research Center, Baqiyatallah University of Medical Sciences in Tehran, Iran, researchers wanted to find out if CVE could help reduce or eliminate some of the negative effects of smoking. Smoking, of course, is one of the known (though definitely modifiable) risk factors for cancer, heart disease, and pulmonary disorders. Oxidative stress has been determined to be one of the key mechanisms that ushers in the harmful health effects of smoking. The researchers conducted blood tests at baseline and then again after the study was completed. Concentrations of vitamin C, vitamin E, glutathione, and malonedialdehyde (MDA) as well as activities of superoxide dismutase, glutathione peroxidase, and catalase were recorded. The research team also measured the ability of CVE to inhibit the formation of free radicals. They found that the six-week supplementation with C. vulgaris extract in smokers was associated with an increase in all antioxidant measures. They also found, interestingly, that only the men showed significant increases in vitamin E.
Panahi, Y., et al., “Investigation of the effects of Chlorella vulgaris supplementation on the modulation of oxidative stress in apparently healthy smokers,” Clin Lab 2013; 59(5-6): 579-87. Yusof, Y.A., et al., “Hot water extract of Chlorella vulgaris induced DNA damage and apoptosis.” Clinics (Sao Paulo) 2010; 65(12): 1,371-7.